A total of more than 900 new homes in Amble are still being backed by planners when they go back before councillors for another decision. Development in areas 7, 8 and 9 are due to be reconsidered by councillors. In common with a raft of other applications at various Northumberland County Council committees recently, the schemes are back because the planning landscape changed while a number of outstanding matters were being dealt with. The Government released its updated planning rulebook – the NPPF – in the summer and so the proposals have been reassessed in light of those changes, but all three are recommended for approval again when they go before the strategic planning committee next Tuesday (December 4). The trio of bids for Amble being revisited were all first approved in late 2017 when hundreds of new houses were given the green light in the space of three months. In November last year, members of the committee granted unanimous permission to an outline bid for up to 166 homes west of the A1068, to be known as Hauxley View. The previous month, Cheviot Holdings, which is also behind the Hauxley View scheme, was given the green light unanimously for its proposals, also in outline, for up to 272 homes on land north-east of Amble Sewage Treatment Works, off Percy Drive. That had followed the committee giving approval to an outline application, by Hindhaugh Homes, for up to 500 homes on land to the south and south-east of James Calvert Spence College, off Acklington Road, in September. During the discussion on these applications, a condition to enable the creation of a link road between the A1068 and Acklington through two of the sites was imposed by the councillors. However, planning officers are now recommending this be dropped following further work on this proposal given that it is not required to make the developments acceptable on highways grounds and the cost is likely to be at least £2.1million, which would have to come from the money being allocated for the likes of affordable homes, education and healthcare. All of the permissions would be subject to section 106 legal agreements to secure contributions of this nature, although the details for the Hindhaugh Homes scheme have not been confirmed yet other than that it will provide 15 per cent affordable housing and money for education, healthcare, sport and play, highway infrastructure and ecological mitigation. 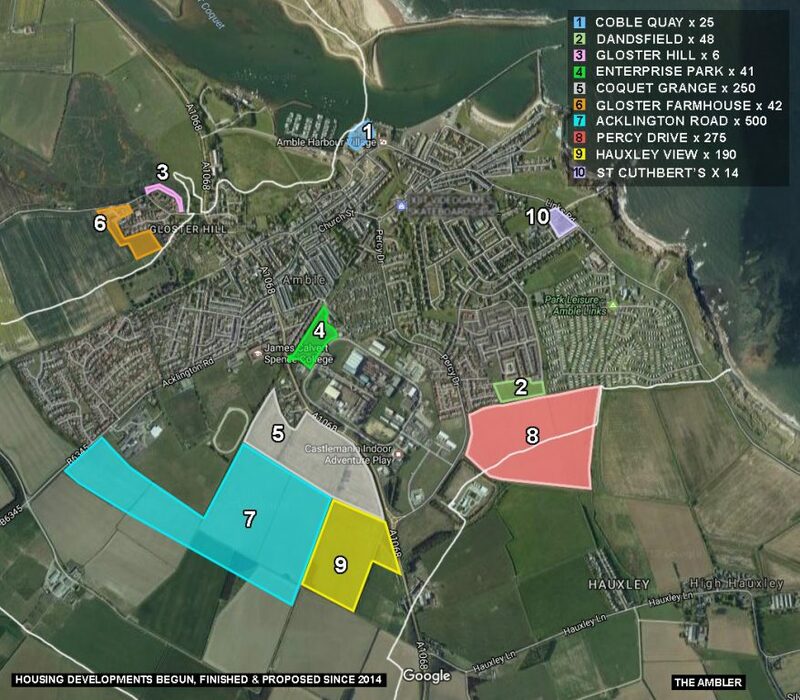 The Hauxley View bid will contribute 15 per cent affordable housing, £435,600 for primary-school provision in Amble and special educational needs provision for children from the development, £112,500 for primary healthcare to be spent in Amble, a £130,000 sports facility contribution to be spent within the Amble parish area and a £99,600 contribution to the council’s ecology coastal mitigation service. One thought on "Link road in doubt as Amble housing reconsidered"
This should reverse the permission as it can not now fulfil the condition which was imposed as part of the granting.